She says you should read the recipe, put it away, and do your own thing. Don’t be afraid to swap an ingredient out or add more or less. Yep! That's pretty much my approach to any recipe. I use them for ideas, and then proceed to throw in the ingredients I have. It's more fun that way! The only problem is that, when I come up with something we especially like, I usually can't repeat it. 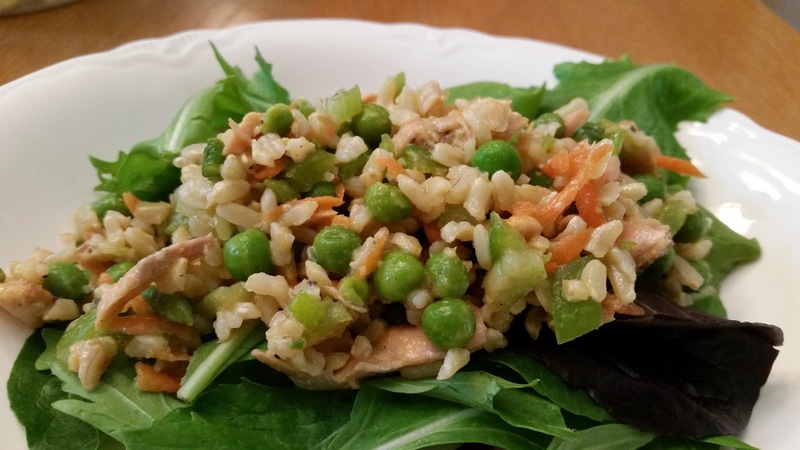 All that to say that I found this recipe on Oprah.com for Brown Rice Salad with Salmon (by searching for 'salmon rice salad' - imagine that!) The recipe already has a lot of leeway built into it - but I thought I better jot down what I used this time - just in case it's the perfect combination. 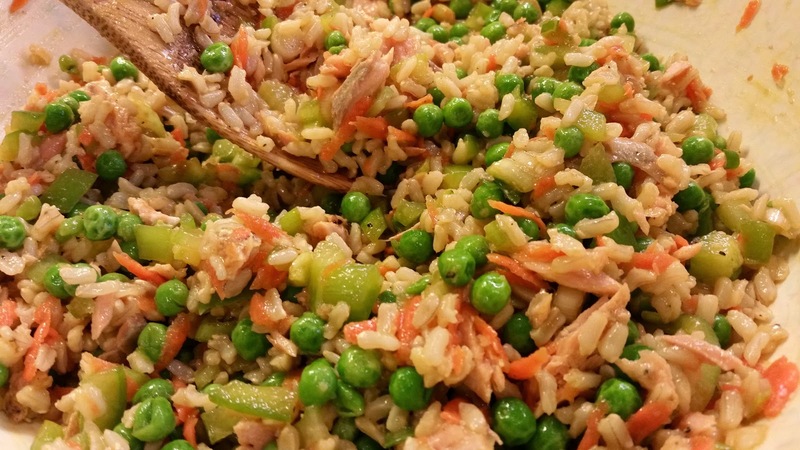 In mixing bowl, combine rice and vegetables. Mix vinegar, soy sauce, oil and salt & pepper; pour over rice mixture and mix well. Add salmon, and toss lightly to combine. Chill well. I'm already noticing that the original recipe called for some cooked vegetables, where I used green pepper and celery, but the rice was hot when I mixed everything, so I'm going to figure that's OK. Besides, they'll add a little crunch. I'm thinking some chow mein noodles on top will be good, too. Potluck tomorrow. We'll see what everyone thinks. It certainly smelled good when I mixed it up. Update: Definitely the perfect combination! This salad has become a favorite around here. It's great for not only a potluck, but as a cool summer meal. It's great with chow mein noodles, on a bed of greens, or just by itself. The verdict is in - This salad is really, really good! Everyone seemed to really like it. I'm not sure I'd call this the perfect combination, but it was really close. I will definitely be making this again. I do want to add a little more salt and pepper than I did, and really want to get some sesame oil and try that. This salad was really good!! I thought it would be very vinegary, but it had a mild flavor, but very tasty! Not fishy either. I liked it a lot! I plan on making this for my family! I made this with Kikkoman's Terryaki Soy Sauce, cuz that was all i had, and it turned out okay, but i think the regular soy sauce is better. I also used black and Mahogany rice, which added color and a creamier texture. This is a very colorful salad and everyone who tried it really liked it! Great blog post, I've been after something like that!? I am very happy you said this!! I have made this salad several times, and we really like it. But one day i didn't have any salmon, so i used cooked turkey instead and most of the vegetables, i don't think i had green pepper. This worked really well also. It really looks nice if you can used more than one kind of rice. I have black and a red rice that i mix with the brown rice, but you have to cook them separately or the black rice makes it all purple!